blahhh they look wayyyyyyyyyyyyyy better on you! lol. lucky. you're soo pretty!!!! r u japanese or u just live there? You look gorgeous!!! And I really like how your eye makeup turned out! Can you do a tutorial on it? You already had those great puppy eyes! Now they're just even harder to resist! :) I <3 EKI! i really want those. they look natural! omg, u look really cute and great with this lenses. and your hair is so cute too. would u do some HOTD ( hair of the day) in your coming posts? soooo pretty!! you look like an innocent doe!<3 oh, Eki, you ALWAYS have the huge, bright-eyed anime doll face look! TOO KAWAII!! love you!<3 hehe :) sigh...i've been wanting to get some so badly!! :( but i've decided skincare needs to come before contacts! and then with all this cute jewelry around me...i really want those too..haha! you so much like a doll! oh you look so cute! Way too cute! Do you need a prescription for the lenses? niceeee :D I'll have a look at their website! Ohh I was wondering how do those look on a person! 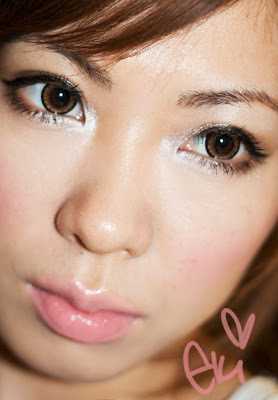 Because I was thinking of getting some angel lenses, to get the doll look :). But I would go for green or blue since I have greenish eyes. But they do really suit you and look soooo natural! they really do give the puppy eyes! you look so cute in brown! What is your opinion on they way they look? do they look really natural or quite noticeable that they are lens? you are so beautiful! can you get those lenses in prescription? I got my Geo Angels in green, the color is darker than I like but still looks good. The brown ones really suit you! So cute, the lenses suit you well! I'm going to get some for sure during their next preorder. so cute! and i really love your simplistic makeup in this! gah, i envy your perfect face, perfect skin, perfect body, and freakin perfect everything @_@. you're just freakin gorgeous! Hi Eki! The lenses look really great on you. eki you are absolutely beautiful!!!! WOOOE those contacts are soo nice!! hehe take care!!! it looks really natural on you eki chan! 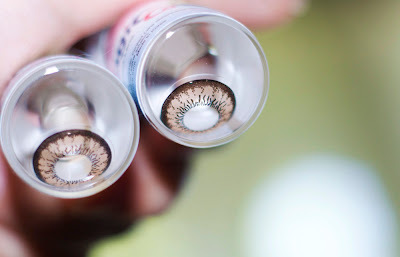 I think these are my fave contacts on you...they look kawaii but very natural. Thank u Eki for sharin this! I am so goin to purchase from them! U look great w/ any eye color..im jaelous..ur so freakn cute!! !